These photos posted beneath came to me thanks to the generosity of Les Swinburne. I am sure there will be more to add to them, but for now they have enabled me to expand what I know of the JACKSONs of Duddington, Northamptonshire, England and Fanningstown, Co. Limerick, Ireland. 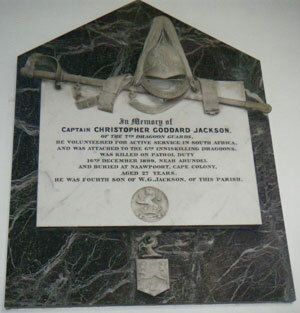 I have added the picture of a marker for Original JACKSON on the basis that he likely belongs in some way with this lot - based on the picture of three birds on his grave marker, as well as geographical proximity. I would be most interested in hearing what others might think. I have updated my tree at Rootsweb to incorborate what I have learned from these gravemarkers - it led to a couple dozen new JACKSON names being added. Sharon Oddie Brown, August 14, 2011. 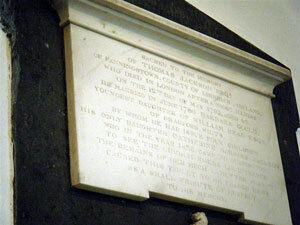 YOUNGEST DAUGHTER OF WILLIAM READ ESQ. AND WAS ATTACHED TO THE 6TH INNISKILLING DRAGOONS. HE WAS THE FOURTH SON OF W.G. JACKSON, OF THIS PARISH. 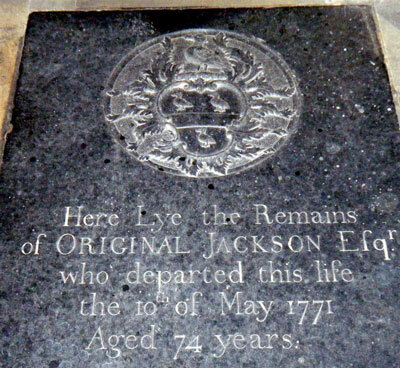 Her father was Christopher JACKSON (1668-1730) and her mother was Joan CHESELDYNE. They resided at Duddington, Co. Northampton, England. NOTE: St. Mary's Church, Duddington is a listed British Building. Thomas JACKSON was the son of Jeremiah JACKSON (abt 1720-1780) of Fanningstown, Croom, Co. Limerick & Katherine COX. I have an unsourced death of Catherine Barbara JACKSON of 1847, of Upwey. Co. Dorset. The location makes sense since her mother was the inheritor of her first husband's estate, and he was of Upwey, Dorset. He was the son of William Goddard JACKSON (1836-1906) of Duddington, Northamptonshire and his wife, Selina Barbara Maria JOHNSON. 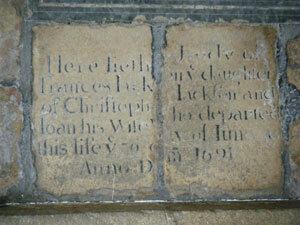 This inscription is in the Church of St. Regimus, in the Parish of Water Newton in Cambridgeshire, England. NOTE: for those not well versed with the geography of English Counties, Cambridgeshire is just east of Northamptonshire - so the connection to the Duddington JACKSONs is not far fetched. Water Newton looks to me to be about 20 miles as the crow flies from Godmanchester - not an insurmountable distance with respect to familial links, and even less - about 7-8 miles from Duddington. In this picture - thank to Les who rephotographed it for us - you can clearly see the three birds that show up repeatedly in JACKSON crests. Miscellaneous Notes on Original JACKSON. There is another Original JACKSON. Notes and Queries, March 21, 1885: St. Nicholas's Church, Whitehaven: April 9, 1787, Isabella Jackson, wife of Original Jackson, buried. NOTE: The curious thing is that St. Nicholas' Church is in Cumbria. In the 1700s, Whitehaven was a large port - second only to London. 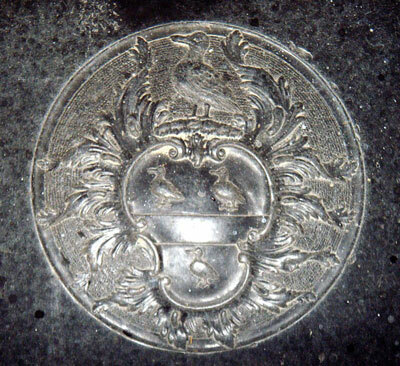 It is also geographically closer to other JACKSON families who shared the three birds in their crest. The South Carolina Historical and Genealogical Magazine, Jan 1918, Vol XIX, has a refence to John Faulkner conveyed to Original Jackson carpenter 92 acres. NOTE: I do not have access to this, but given the mention of Falkner's Meadow in the will of Original JACKSON, this pricks my curiosity.